This is the most unique album of 1978. I say that without hearing everything that year, but I would probably explode if I was proved wrong! Kate Bush has an odd way of writing songs. They feel romantic and theatrical, and the lyrical matter is extremely literate, much of the time taken directly out of novels (the song "Wuthering Heights" is an obvious example). Her songs are so unusual that she has absolutely no parallels. She came completely out of nowhere. In interviews, she stated that Elton John was a major influence, but you'd need an overactive imagination to think he would ever come out with anything even remotely like this album! As the legend goes, she was discovered when she was 15 when she played some of these songs for David Gilmour. Captivated by her, she recorded a few demos, and the record company paid for her to spend a few years at an art college to develop her sound. Well, their efforts certainly paid off! The funny thing is they still let her do her own thing. It's hard to imagine that anyone would think this album had commercial potential in 1978. There was nothing else like it! It's difficult to figure out exactly what made this album tick --- the important thing is that it did tick, and the music sounds so excellent! After-the-fact, it's no major surprise that she managed to captivate the British public. After all, the music is pretty. The British still haven't forgotten her big hit, "Wuthering Heights." What a song!! You're not going to find any other like it. Nothing about it is usual apart from the fact that the primary instrument is an ordinary piano, but it quickly draws me in its powerful grasp, much like its literary counterpart. Wonderful! If you hear it, I'm sure you won't forget it soon, either! The second hit from the album was "The Man With the Child in His Eyes," which is a straight piano ballad and constitutes the album's most normal song. Bush's voice and how she uses it only adds to the oddity of the album! She can hit the incredibly high-pitched registers and, within seconds, bend her voice down to almost a tenor's range. Even when she's singing normally, I love the tone of it; it's entirely intoxicating. One of my all time favorite tracks that I failed to mention so far is "Them Heavy People." It seems it has vague reggae roots, but its strictly another one of Bush's oddly captivating songs with a funny melody and offbeat instrumentation. I want to mention other highlights, but they're difficult to pick out. This is one of those rare albums in which every song seems like a highlight. It's quite a work! If there's someone you shouldn't rush it's Kate Bush. 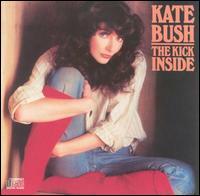 After the surprise success of her wholly unusual debut album, The Kick Inside, the studio demanded a quick follow-up. Bush had something like three months to write and record these songs. But she ended up using a lot of material she wrote earlier (some of which dated when she was 15) but didn't use in her previous album. However, Bush being the fantastically magical singer-songwriter she is, manages to sound remarkably good. Lionheart gets such a horrible rap from music critics (and even Kate Bush herself) that it's rather disconcerting only due to the fact that I love Lionheart to pieces. Sure, songs like "Kashka From Baghad" are relatively atrocious, but that's only on the standards Kate set for herself on her excellent debut album. "In Search of Peter Pan" is every bit as engaging as anything from her debut. Considering that she packs the instrumentation on here strongly, this habit of sounding engaging is accented further. Sure, these songs aren't as fantastically maniacal and bold as The Kick Inside, but many of them still have a distinct, unearthly aura, and, as I mentioned, these songs are as engaging as heck. "Wow" is so gorgeous and fantastic that it narrowly beats the other songs as the album highlight. That awe-inspired chorus draws fond comparisons to Procol Harum, and it has an atmosphere that cannot be described in any other way than magical. Other tracks such as the splendid album opener "Symphony in Blue," the strange rocker "Don't Push Your Foot on the Heartbrake," the minimal but still engaging lounge-song "In the Warm Room," and the wholly unusual pop song "Hammer Horror" is more than enough to make this effort extremely well worth it. So, please nobody snub this album on account of The Kick Inside or its "rough" history! It deserves much more! It's fantastic! There's way too much goodness to ignore!!!!! I IMPLORE THEE!!!!!!!!!!! 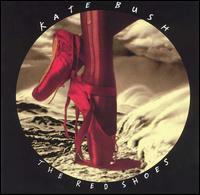 Kate Bush discovered world music and fancy production thanks to her new friend Peter Gabriel. This ushered in a new era for Bush, which began to triumph synthscapes and lush arrangements to create the rich moods she was going after. Lionheart was already a step in this direction, but now it's even more elaborate. The result? It's one of her most engaging albums, that's what! Every one of these tracks are gloriously produced with thick, illustrious and enchanting instrumentation, which use classical or traditional instruments as well as synthesizers. All of these songs are brilliantly arranged! (And make no mistake about Kate Bush's genius. She co-produced this.) The world music aspect is indeed new, and that's something Bush would continue to develop in future albums. In a sense, Never For Ever is also a shift toward being more melodic. The Kick Inside was aimed more predominantly at being theatrical and otherworldly, and that often didn't leave much room for straight melodies. Also, Bush is tending to tame her voice to sound more accessible, less bendy and not so much like an untamed musical instrument. "Babooshka" is easily the most well-known song, and it was one of Bush's biggest chart successes in the UK (though not nearly as successful as "Wuthering Heights"). Although, it is mightily enchanting and endearing, that's not all there is! A less dynamic song is "Delius (Song of Summer)", but it's magical thanks to Bush's incredible siren-like vocal performance. "Egypt" is probably the best "world-music" bit with its Middle Eastern flavor! "Army Dreamers" is a very short song, but it's an enchanting waltz that you'll savor forever! The final song on here, "Breathing" is such an incredibly superb and dynamic song. In fact, everything on this album is great. Listen to everything! This is, in my "humble opinion," one of the most fascinating rock albums ever made. The music is hugely ambitious and, unlike the vast majority of experimental music ever made, it's also hugely enjoyable. All of the above applies to The Dreaming: It's intelligent, deep, inspired, unique, thought-provoking, literate, and (most importantly) freaking excellent. You might not want to play it for your friends (bad idea; I tried it), but if you want music that you can listen to intensely on your very own that is sure to grow on you with time, then this is your ticket. The rest of you can waste your time with Madonna. Speaking of Madonna, this is also one of the craziest albums ever made!! Bush had coined this her "mad" album, and that's exactly the feeling I get about it; she sounds positively paranoid through much of it! This was most likely inspired by Peter Gabriel's mad-genius album Peter Gabriel 3: Melt, which Kate had a guest spot on, but this has her own twisted personality throughout it. That plus, she's one of the greatest vocal performers, female or male, of all time, and she's using her entire range. Kate Bush is such a versatile singer that if you were daring enough to count all her singing voices (which I haven't), you'll probably find more than two dozen. (Examples of her different voices are relatively normal, squealing, pixie-like, screaming bloody murder, screaming like a bloody murderer, snake-like, smarmy cockney British, etc., etc.) There is so much to get out of these voices, and I guarantee that you'll gladly spend years sorting it out. I could rant about this album forever, but I'm extremely fascinated with every single one of the songs. The feeling throughout the album is so successfully mad and twisted (while still being palatable) that I can't get enough of it. Musically, the album has much to offer! The first two songs are mad and very British sounding ("There Goes a Tenner," she clearly sports her British accent). "Pull Out the Pin" is a brilliant composition and is likely one of Bush's most emotionally resonant songs (her heart-wrenching screams "I LOVE LIFE" throughout do not go unnoticed). "Suspended in Gaffa" is a brilliant and thoroughly mad waltz with a melody that's so infectious that it stings. "Leave it Open" is frightening, but not nearly as much that she'll even top with the final track, "Get Out of My House," a horror movie within a song. The title track is also hugely memorable that features some bagpipe sounds at the end. "Night of the Swallow" is almost a return to her The Kick Inside roots except it manages to be more twisted. "All the Love" isn't one of the primary songs that you'll probably remember from this album, but it's enchanting! "Houdini" features two Kate Bush voices --- One voice is some of the most beautiful vocals she's ever done, but the second is some of her most frightening. I have an delightfully difficult time figuring out which of songs I like the most, so I'll just say I like them all. That's a rarity; virtually any one of these songs I'm sure I might be able to call my favorite. Speaking of favorite, this album will probably always be in my Top 5. I would hate to start out this album review on a negative note, but it must be done. 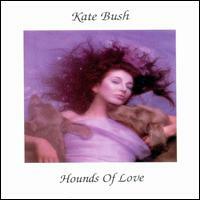 It's clear that Hounds of Love isn't better than The Dreaming. The general public disagrees with that assessment, but the simple fact remains. The good news is that there are only about five albums in the world better than The Dreaming, and Hounds of Love isn't too far behind. Haven't you heard? KATE BUSH IS A FRIKIN' MUSICAL GENIUS!!!!!!!!!!! Bush was apparently wanting to streamline her sound to appeal to a broader audience. According to her, she didn't do this consciously. You begin to think that Bush's claim has some credence when you compare the effect of one of the major hit singles, "Running Up That Hill (A Deal With God)," had on the people. It turned out to be a major club-dance classic (we're talking about the U.K. here), but if you look at Bush's music video, she clearly envisioned it as more classical. The first five tracks are meant to be Bush's pop singles although the atmospheric "Mother Stands for Comfort" never had much pop potential. My favorite piece from this half is the delicious "Cloudbusting," which features crunchy violins. The music video, which co-starred Donald Sutherland, was apparently one of the stars of the MTV era at its peak! The title track is also quite a treat, and it's as lushly and perfectly produced as anything. The following seven tracks are a musical suite called The Ninth Wave. It begins with a beautiful piano-based ballad ("And Dream of Sheep"), which is followed up by a weird, atmospheric track that consists of an evil demon voice ("Waking the Witch"). Later on, there's a traditional Celtic song ("The Jig of Life"). Bush said she always wanted to try that style, because that's what her family members would play during her childhood. I'm not mentioning every song here, but every song is well worth the price of admission. Really, this stuff is pretty alluring and brilliant! All in all, this is another masterpiece. Furthermore, reviewing this album has only made me want to gladly continue to blast "Running Up That Hill (A Deal With God)" out of my car stereo until my ears bleed. Some Kate Bush fans consider this exceedingly pop-oriented album a disappointment after the release of her weird and delightful Hounds of Love. Others only know her for doing this album and find her previous work too weird for their tastes. Whatever the case may be, this is another classic that she can put on her this-far spotless record. It�s true that it�s more pop-oriented as well as a lesser work in general, but that�s not a major crime. This is brilliant pop music! Those who complain that she took a bad turn with this release after Hounds of Love might not have been following her career too well. Ever since her beginnings with The Kick Inside to the lushly arranged Never For Ever and the vastly experimental The Dreaming, she�s always been shifting directions. So, this album shouldn�t be much of a shock to anyone. However, I do admit that I liked Bush better when she was singing about literature instead of this album�s topic, sensuality. Nevertheless, these lyrics are head-over-heels better than most pop artists�. As always, this album is full of great musical ideas and melodies that are brimming to the core with beauty! People who only listen to pop music from mainstream divas like Mariah Carey should listen to this vastly superior album for comparison. I would like to point out, mainly, the song arrangements. Most pop albums have awful arrangements as if the producers didn�t care (and perhaps they didn�t). But The Sensual World gives as much care to the arrangements as the melodies and vocal performances. Bush might not have the same vocal capabilities as Mariah Carey, but she is a vastly superior singer expression-wise. That�s something I�ve always been touting about Bush! The best song of the album, in my opinion, happens to be the most popular one. �The Sensual World� is an otherworldly, and it hooks me right from the beginning. I admit that it might not be such a manly song to like, but I can�t get enough of it. This is also the perfect song to hear what I mean about Bush�s arrangement capabilities. Brilliant! A less famous highlight is �Heads We�re Dancing,� which Bush seems to be singing directly to heaven. �This Woman�s Work� is a popular ballad that was originally featured on the horrible movie She's Having a Baby, but it's one of Bush�s most passionate and endearing ballads. I always thought it was slightly boring, but I still think the melody is great and I love that voice. There is so little to complain about that I can't help but call this another one of her surefire classics. �Between a Man and Woman� is easily the weakest track even though it still has merit. Likewise �Walk Straight Down the Middle� isn�t that inspired, but at least the melody is hooky. So even the weak stuff has its redeeming factors. Naturally, this album is recommended to everyone. The art-crowd will like Bush�s always interesting ideas and the pop-crowd ought to enjoy the album�s pop sensibilities. Go out and get it immediately!!! Do you know how much of a Kate Bush fanboy I am? I even like *this* album. That wasn't always the case. I bought it a few years ago, and I didn't think much of it. The orchestral arrangements are woefully minimal an uncreative compared to her previous works. This is the closest that Bush ever did to a normal album. I just turned it off and re-listened to The Dreaming for the eight billionth time. ..... BUT that doesn't mean that The Red Shoes is a normal album. It's still miles above what most everyone else was making in 1993. The reason it's not a masterpiece isn't because she had run out of melodic ideas (they're about as rich as they ever were) but this effort really doesn't come together as a coherent album. Individually, EVERY song is good, but I don't get quite the adventurous feeling I gather in her other works. This is because she throws in almost mainstream pop songs in with her usual performance-ballads. "Rubberband Girl" and "Constellation of the Heart" both sound like she was trying for something that would be at home in Peter Gabriel's So. Well, they're great songs, but ... nobody really wanted Kate Bush to be a singles artist!!!!! This is her only non-album oriented work. When you look into the matter further, Bush had a positively legitimate "excuse." She was planning to take this album on a worldwide tour, which unfortunately never happened. Bush, having a rather notorious reputation for being a perfectionist (whether that's warranted or not), wanted to make the material on this album optimal for live performances. It probably was. Many have called this album dated --- and even behind-the-times --- with the dominating drum machine sounds and the synthesizers. For some reason, this aspect never bothered me. Despite the lack of instrumental ideas, Bush still seems like she knows what she's doing. The '80s production standards certainly had its horrible examples, but it still has good examples. This is one of the good examples. For that reason, it shouldn't matter that it was 1993. What did you want? Kate to go grunge? This is the poppiest album Bush ever did (and most accessible since it's her highest charting release in America), but there's still that alien edge about it that always keeps it interesting. Her synths are simple, but they're well chosen ones. (That wispy synth on "Rubberband Girl" immediately comes to mind.) The dance grooves seem like hardly anything Madonna had the will-power to muster up. She's still even doing those "And Dream of Sheep" esque ballads, which are always a joy to hear. Kate Bush is a real class-act. The Red Shoes doesn't rob her of that reputation, but enhances it. She never released a bad album ever. I used to think this was disappointing --- it probably still is --- but all it took was a serious listen for me to change my mind. 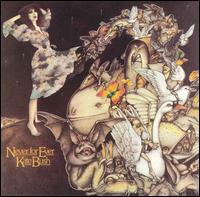 Kate Bush is quite an interesting pop star. It had been 12 years since her last release, and she remained completely secluded and out of the limelight for almost that entire time. This seclusion was so severe that she even had a baby in 1998, and nobody knew about it! 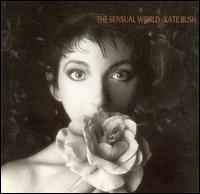 (Well, Kate probably knew about it...) Somehow through all this time, when Bush released her first and only single from the album, "King of the Mountain," it hit #4 on the U.K. pop charts. This was her third most successful chart rating only seconded by "Wuthering Heights" and "Running Up That Hill." She did very limited promotion for it, so the only explanation for this is that Bush's legacy was considered nothing but legendary. 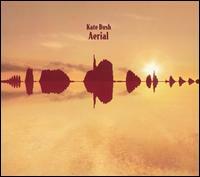 When the album Aerial was eventually released, it saw similar success on the pop charts. It entered #3 in the U.K. and sold more than a million copies. The first disc begins with an addictive and thunderous "King of the Mountain" that does an excellent job drawing me in! But the real gem of the first disc (and the whole album for that matter) is "Pi," Bush's ode to a mathematician who can't do anything but calculate that number. It's perhaps her most engaging "character study" of her career, and that one's particularly hypnotic. Bush doesn't forget to deliver a couple of beautiful piano-led songs. One of which, "A Coral Room" is utterly heartfelt. The other is "Ms. Bartozzi," frankly one of the most boring songs of the album, but it does shed some light on what Bush was doing all these years she was absent (i.e., being a regular person). "Joanni" is another special gem on the first side; that one's so beautiful and engaging that it's too easy to fall in love with. The second disc is also quite an experience, and it's certainly more even than the first. As I said, the theme of it is "bird song." I don't quite understand everything she does, but there are tracks with bird song soundscapes inserted throughout. The musical mood in this second disc is enormously calming and laid back, and it seems the only proper way to listen to it is if you're in such a somber mood. (Obviously, if you're in a head-banging mood, yer barking up the wrong tree!) It's almost difficult describing each track, because they all seem to redefine beauty, but that's why this disc is so fantastic for "soaking up." I won't go through every track since they're all A-level and by definition all highlights. But the best of the best include the hopelessly gorgeous, ethereal "An Architect's Dream," one of the finest melodies of the album! That one's so vibrant that you can see exactly what Bush is singing in the lyrics (about a painter working on a masterpiece). That's followed up with a brief but incredibly memorable "Painter's Link." "Somewhere in Between" is another masterpiece that absolutely captivating and even intoxicating. The orchestration there is especially lovely, and it probably features Bush's finest vocal performance. It's worth mentioning that Bush apparently lost some of her vocal range over the years. It's possible that she's just using the mellow range of her voice, because that's what the music she wrote calls for. I still think she has a beautiful voice! 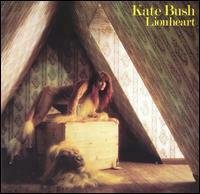 I guess the good news is that she's sounding much more accessible here --- well, that's good news to anyone who still thinks "Wuthering Heights" is too weird to be liked, I guess...... Well, if Kate Bush can put out a double album like this, then it's OK that she took so dang long coming out with it! But seriously, here's hoping that there won't be another 12 years until the next release.